Removal Companies To Spain - Why Is Insurance Important? Removal companies to Spain offer many different packages to allow you to find the best options for you when it comes to your international move. But no matter how good their prices or the great deals they offer, if they are not insured you should walk away. Advance Moves has insurance policies in place to cover your international move. 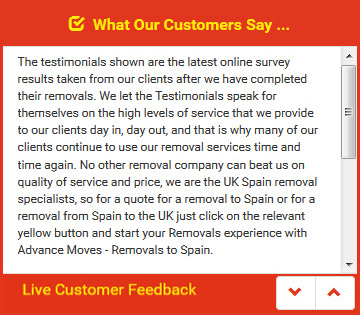 As one of the top removal companies to Spain, we know the concerns you might have, and we work hard to set your mind at rest. Contact us on 0871 218 0612 or email info@advancemoves.com. Alternatively, you can visit our website (http://www.advancemoves.com/) for a quick quote.